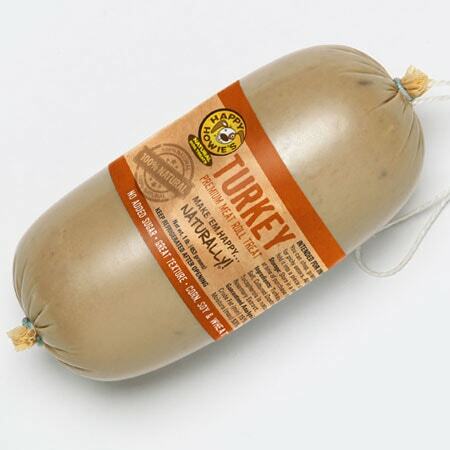 1-lb TURKEY ROLL – The preferred training treat of expert dog trainers throughout the country. Short on ingredients and large on flavor, these rolls make training easier and more fun. You can also use these rolls as a food topper or to hide a pill. 1-lb TURKEY ROLL – Happy Howie’s Premium Turkey Rolls are love at first bite! Our rolls are the only high-value training treat with fewer ingredients that doesn’t crumble in your hands. 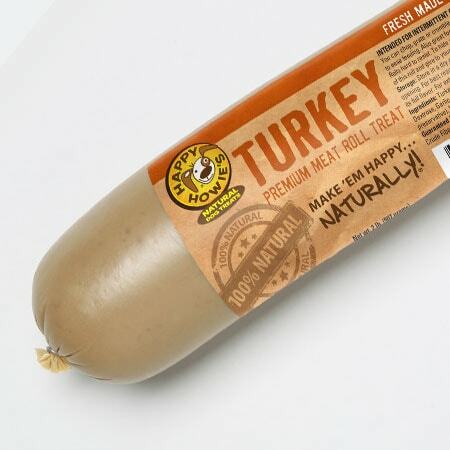 Made in the USA with all-natural turkey, these rolls cut up easily into smaller pieces that are an excellent way to hide pills, use as a food topper or simply to reward your dog! 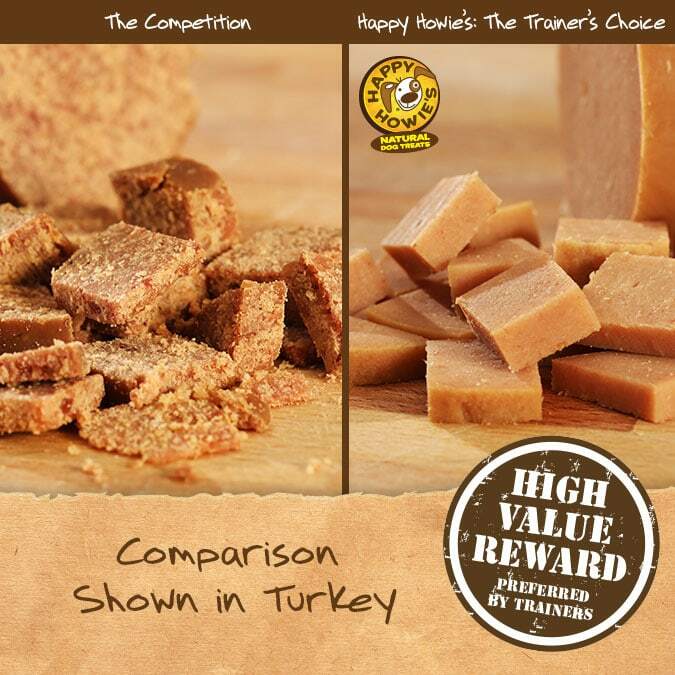 Find out why our deli-style Premium Turkey Rolls are the training treat preferred by expert dog trainers throughout the country. Ingredients: Turkey, Rice Flour, Sodium Lactate, Salt, Garlic, Dried Cultured Skim Milk, Citric Acid, Mixed Tocopherols (a natural preservative), Vegetable Oil, Rosemary Extract. Made in the USA! These treats are great for training. I like the option of cutting the roll into larger and smaller treats. My dog also has a sensitive stomach and these treats do not cause any issues for her! A friend recommended the meat rolls for training. We like how they cut and dice to any size, plus our dog loves all flavors. My 3 dogs absolutely love the turkey roll. We cut it up for training treats and freeze them, thawing out as needed. We do whistle training for recalling our dogs…. they come running knowing they will get a turkey treat! I am a trainer and have been working with dogs professionally for 11 years. These treats are great because you can cut them up extra small to get more bang for you buck. The dogs LOVE them and they don’t crumble which is great. I recommend Happy Howie’s to all my clients. A friend’s trainer suggested that the Turkey Roll would be THE high value treat for my very independent Irish Terrier. So the truth is, it is … but not all the time. But it’s far better than his regular treats and I use it specifically for IMPORTANT things like recall, stop, etc. 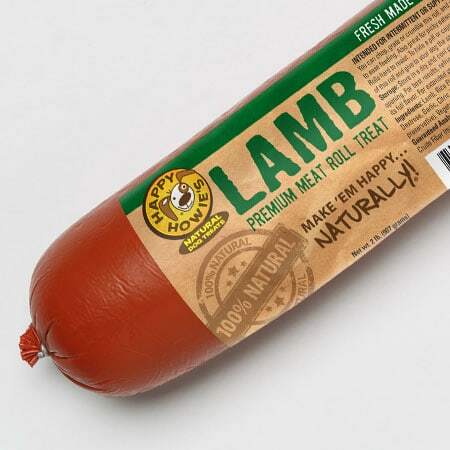 I’m ordering again soon and will try the Lamb Roll because he’s never, to my knowledge, tasted Lamb and that might help this Happy Howie’s treat THE indispensible treat in my training kit. I’ll let you know. 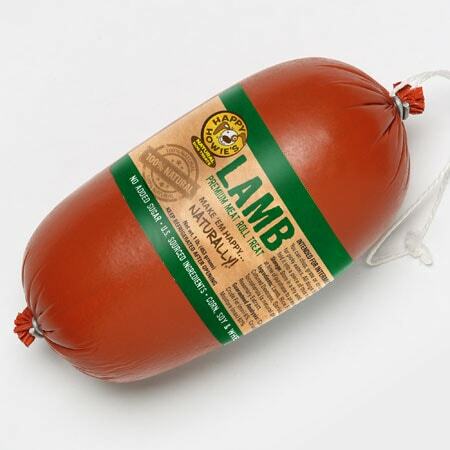 My dog absolutely loved this roll of meat. I will be defiantly be ording again! 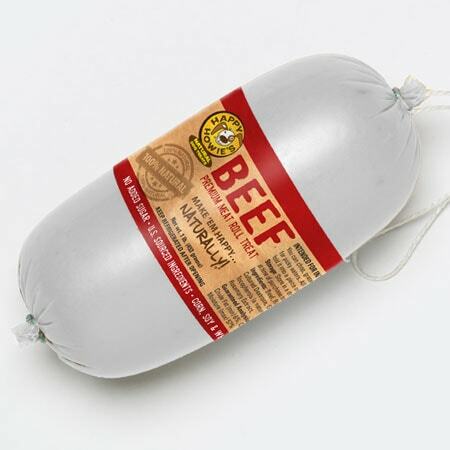 I highly recommend this meat roll my dog goes crazy over it!